18" x 18", 18" round. Table Height: 27"
1-1/2" x .050" x 15'4"
Length settings of 0 - 20" are accomplished with simple programming at the operator's touch screen. The shuttle comes to positive stops at both ends of the index, assuring cutoff length accuracy, reducing material loss. Repeatability is ± .005 per index. Blade Drive: 7-1/2 H.P., Hydraulic Pump Motor: 2 H.P., Coolant Pump Motor: 1/4 H.P. - All motors are dual voltage, choose 230 or 460 Volts, 3 ph. 60 Hz. Conveniently located on the operator's control panel, this touch screen control allows the operator to program and store up to nine jobs. Inputs include Part Lengths from 0 to 400" and Number of Pieces to be cut. The Blade Speed is displayed on and set using the touch screen, but is not stored in memory. 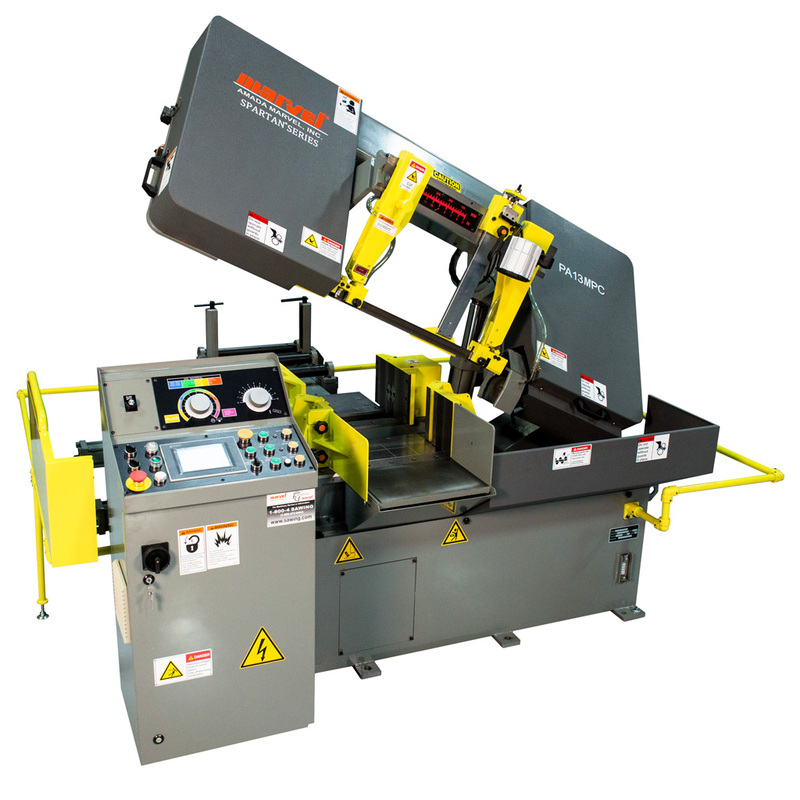 The Automatic Piece counter stops each job when the pre-set number of cuts has been made. The control provides the option of running up to 20 jobs consecutively. The combination roller bearing and carbide blade guides reduce heat and blade stress providing longer blade life and accuracies of ± .002 per inch of cut material. Large anti-vibration rollers help to increase blade life. The Front Vise jaws are split to reduce the remnant to as little as 3". The split vise jaws also help to reduce burrs left on the material and are ideal for bundle cutting. Holding the work piece on both sides of the blade reduces blade vibration, providing more accurate cuts and longer blade life. Replaces standard control console mounted to machine base with a free standing pedestal and 6’ flexible electrical and hydraulic lines (Special Factory Order only). Table is constructed from 4” x 5.4 lb. Channel with ten 2.5” diameter ball bearing rollers on 6” centers. Fitting First roller conveyors, the coolant pan collects and returns coolant back to machine. Included is the pan, V-trough, and hangers.